Representatives from the 29 countries that form the North Atlantic Treaty Organization (NATO) will gather for a summit this month in Brussels. The meeting takes place amid increased tensions between the United States and its NATO allies. Topics likely to be addressed include relations with Russia, joint military operations and member countries’ spending on collective defense. 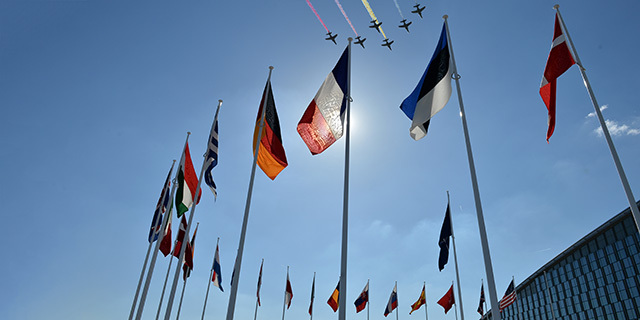 1 NATO is viewed favorably by people in the U.S. and many member countries. About six-in-ten Americans (62%) had a favorable opinion of NATO in a 2017 Pew Research Center survey of the U.S. and 11 other member countries. U.S. goodwill toward the alliance was significantly higher than in 2016, when 53% had a favorable view. Across all 12 NATO member countries included in the 2017 survey, a median of 61% approved of the alliance, including a majority of respondents in every country except Spain, Greece and Turkey. In the Netherlands and Poland, roughly eight-in-ten (79%) said they have a positive view of NATO. Favorable views of NATO increased in many of these European countries between 2016 and 2017. 2 Europeans generally expect the U.S. to use military force to defend a NATO ally from a Russian attack, but they are less supportive of using their own armed forces under the same circumstances. One of the central tenets of NATO’s founding treaty is Article 5, which commits member countries to defending each other against an attack. The Center’s 2017 survey found that people in many NATO countries believe the U.S. would come to the aid of a fellow alliance member if that ally were involved in a serious military conflict with Russia. When asked the same about their own country’s defense of an ally, however, people in these countries were generally less supportive of military intervention. In seven of 10 European countries where people were asked about military defense of a NATO ally, more respondents said that the U.S. would use force to defend a NATO ally than said their own country should use military force under the same circumstances. In Greece, for example, 62% said the U.S. would use military force to defend a NATO ally from a hypothetical attack by Russia, but only 25% said the Greek military should come to that ally’s defense in the same situation. Only in Hungary, the Netherlands and Poland did similar shares of people say their own country’s military should intervene against a potential attack by Russia and said the U.S. military would do the same. NATO recommends that member countries commit 2% of their gross domestic product to defense expenditures. Yet just four out of 28 member countries meet this threshold. The U.S. dedicates the greatest share of its GDP to defense spending (3.57%), followed by Greece (2.36%), the UK (2.12%) and Estonia (2.08%). At the other end of the spectrum, Slovenia, Spain, Belgium and Luxembourg all dedicate less than 1% of their GDP to defense. 4 Many Americans say NATO does too little to solve global problems. In an October 2017 Pew Research Center survey, almost half of Americans (48%) said NATO does not do enough to help solve world problems. About a third (31%) said NATO does the right amount, while just 5% said the alliance does too much to solve the world’s problems. Among those who said they think NATO does the right amount, Democrats (36%) and independents (32%) were more likely to approve of the status quo than Republicans (22%). 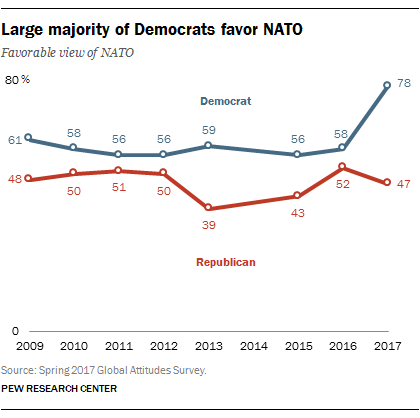 5 In the U.S., views of NATO have surged among Democrats but generally remained steady among Republicans. Almost eight-in-ten (78%) approved of NATO in the 2017 survey – a 20-point increase from the 58% who approved in 2016. Democratic opinions of the alliance had generally remained stable in prior years. In contrast, just 47% of Republicans felt the same in 2017 – little changed from previous years. Roughly six-in-ten independents (59%) approved as of last year.